Apple's once all-conquering iPod line is now a shadow of its former self. In 2017, the Cupertino-based company discontinued the iPod Nano and iPod Shuffle models, leaving only the iPod Touch as the sole music player still sold in the Apple Store. The latter has not received a lick of paint in four years. The sixth-generation iPod Touch was launched worldwide in 2015 alongside the iPhone 6S and iPhone 6S Plus. The iOS-powered music player, which is available in six different colours, still sells for £199 for 32GB of in-built storage, and £299 for 128GB today. But that could change later this year, according to a new report from technology blog Macotakara. According to sources within the supply chain, Apple is starting work on an all-new iPod Touch that will closely resemble the design of the iPhone Xr. That means it'll have the same all-screen design as the iPhone XS, but use an LCD – or Liquid Retina, as Apple likes to call it – instead of the OLED panel in the latter. Like the latest iPhone models, the new iPod Touch will also likely support Face ID, which unlocks the handsets and authenticates payments with facial recognition. This also means iPod users will likely be able to send Animoji and MeMoji, as well as shoot Portrait Mode-style images from the front-facing camera. Updating the iPod Touch makes a lot of sense for Apple. After all, this is the most affordable iOS device available in the Apple Store – and therefore a way for Apple to continue to grow its install base. Having more people using iOS means it's more likely to sell iCloud storage plans, Apple Music subscriptions, App Store and iTunes Store purchases, and subscriptions to its forthcoming video streaming service. The iPod Touch also targets younger users who aren’t ready for their first smartphone. 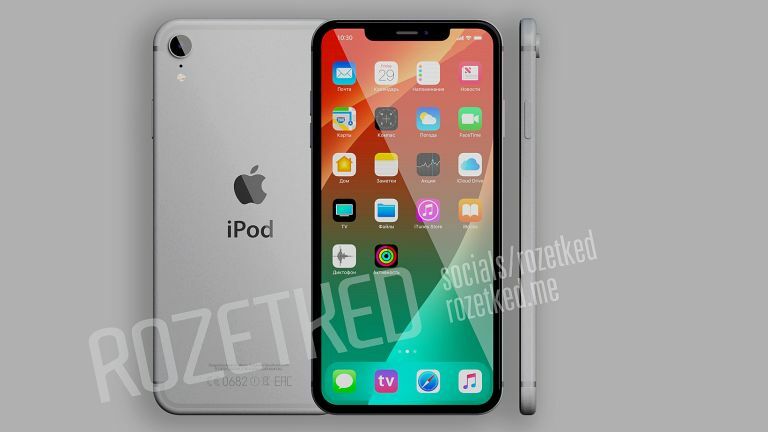 Spurred on by the rumoured redesign in the pipeline, Rozetked contributor and prominent designer Anton Kiuriles has mocked-up what the seventh-generation iPod Touch could look like. Kiuriles envisions the next iPod will be powered by the Apple A11 chipset, which first appeared in the iPhone 8, iPhone 8 Plus, and iPhone X, coupled with 2GB of RAM, and either 128GB or 256GB of non-expandable internal storage. The concept design also shows the iPod Touch with a 7-inch display. While that would undoubtedly be cool to see, and would be amazing for streaming Netflix boxsets on-the-move, it doesn't seem like something Apple would do. The biggest screen in its current line-up belongs to iPhone XS Max, which tops-out at 6.5-inches. Still, if the next iPod Touch looks anything close to these images, it's going to be a massive upgrade for anyone currently on the fence about whether to plump for the Apple-branded music player.